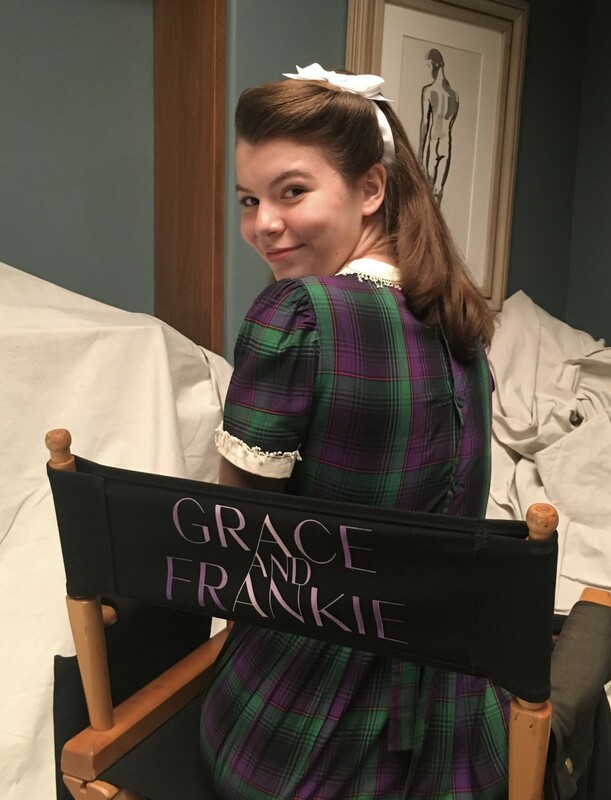 I had the pleasure of interviewing Sarah Kay Jolly, an actress who is best known for her role as Young Teddie on the critically acclaimed Netflix series, Grace and Frankie. When she’s not on set, Sarah loves relaxing with her dogs, watching YouTube, journaling, and spending time with her friends. I was always kind of an odd kid. While I liked sports and was pretty athletic, playing sports never fully satisfied me. I preferred playing dress up in my room and writing my own songs and stories. When I was 9, I started acting. I immediately loved it and knew I found my calling. After performing in several theater productions, I started becoming interested in film and television acting. Somehow, I convinced my parents to take me to Los Angeles for pilot season. I spent the next several years between Los Angeles and Colorado. The rest is history! Can you share the funniest or most interesting story that occurred to you in the course of your acting career? About two years ago, when I was on set for AMC’s hit show Preacher, we were taking a short break from filming. I was hanging out and talking with my mom. I was telling her how amazingly hot Dominic Cooper, my scene partner and lead of the show, was. I was going on and on, rambling about his beautiful accent and his gorgeous good looks. After gushing about how hot he was for about 2 minutes, I looked at my mom’s face and she was super red. I asked her if everything was okay and she told me to turn around. The Director, Seth Rogen, and several of the crew had their headsets on and were laughing super hard. Apparently I forgot to turn my microphone off during break, so all of them were listening to me gushing and drooling over Dominic Cooper. When we returned from break Seth Rogen teased me about it. Super embarrassing!!! One of the coolest and most challenging projects that I recently wrapped production on is an independent film called Emma Rae. The film explores issues of abuse, drugs and bullying. Emma Rae is a teenager, who has been discarded by most people in her life. She lives in a home where she is physically, emotionally and sexually abused. She is pushed and pushed, until one day, Emma Rae pushes back. I was super fortunate to attend the 2018 Cannes Film Festival for the very first public screening of Emma Rae. It was an amazing once in a lifetime opportunity. On September 7, 2018, Emma Rae will be making its US premiere at the Burbank International Film Festival. We are hoping to turn Emma Rae in to a feature film in the very near future. I’ve been super fortunate and have met some amazing people in the industry. A few of my favorites are Seth Rogen, Jane Fonda, Lily Tomlin, and Wiz Khalifa. Working with Jane Fonda and Lily Tomlin was such an honor! Be yourself! Realize that not everyone is going to love your work and just accept it. If you are true to yourself and are real in your craft, good things will eventually happen. It takes time and dedication, but its worth it. I would love to educate people about mental health issues. I think that these issues are often misunderstood or overlooked, and people can be very judgmental due to a lack of understanding. If more people understood what other people were going through, such as eating disorders, depression, anxiety, etc., the world would be so much more compassionate and accepting. #1 You won’t always book the role. You will hear “no” much more frequently than you hear “yes.” Don’t give up! Use each audition as an opportunity and a learning experience. #2 Actors are normal people. Most of my friends that are actors are the most down to earth people I have ever met. #3 The path to success is a marathon, not a sprint. Achieving success in the entertainment industry is a super long process and huge commitment. Don’t expect to move to Hollywood and automatically become famous. A lot of time and energy goes into training, auditioning and ultimately booking. You have to truly stay committed to your craft and work really hard. #4 Sometimes you’ll feel discouraged and unmotivated. After not getting a callback or booking for a while, you start to doubt yourself. This is totally normal. Rejection is difficult and it’s hard to not take it personally. Don’t give up. It is really important to remember that it takes time. #5 Booking a role is not necessarily about how good of an actor you are. You could be the greatest actor on earth, but still not book the role. Casting may be looking for someone taller, shorter, with darker hair, with lighter hair, someone older, someone younger, etc. The possibilities of why you didn’t book a role are endless. You can’t let the fact that you didn’t book a role that you loved get you down. You have to stay positive, put in the work and know that the right role with come to you. “If you focus on the hurt, you will continue to suffer. If you focus on the lesson, you will continue to grow.” Author Unknown. This quote is very relevant in my life. I’ve had many disappointing times throughout my career. I have been discouraged and felt like giving up. When I realized that everything happens for a reason, I knew that I had to stay focused on the positive, and remember that the hard times would teach me valuable lessons. My manager, Nita Brochu, has helped me a lot over the years. Around the time I signed with Nita, I was ready to give up and stop acting. Nita gave me a new sense of drive and optimism. Nita has always believed in me no matter what, and she helped me learn to believe in myself again. When I am feeling overwhelmed, she knows just the right thing to say to make me feel better. If I am going through a hard time or feeling down, I can always call her and she finds the positive in challenges and uses them to make me stronger. Nita has been an amazing support, and she has helped me become the actress and person I’ve always wanted to be. I am so grateful to have her in my life! Zendaya! Without a doubt, I would love to have lunch with Zendaya. She is a huge inspiration to me. She grew up as a Disney star, but has evolved into a very diverse, strong young actress. Sometimes making the transition from child star to a serious adult actor is difficult, but Zendaya made it look effortless. Zendaya has transformed from a Disney star to a beautiful, empowering woman who is an inspiration to young women all over the world. She speaks up for what she believes in and handles tough or controversial situations in a very graceful way. I would love the opportunity to talk to her and hear her perspective on the entertainment industry and her experiences in the business.